When we bought our land in Manly, if our neighbour was to be given a report card on his ability to maintain the grounds and building in a clean and tidy manner, in the comments section of said card, one would almost certainly have read the words: "Could do Better". He was a nice enough bloke, for a drug addicted alcoholic biker, and we'd spoken to him many times in the year or so between buying the land and starting construction. When it came time to build we had a few choices in ways of obtaining temporary electrical power for the duration of the project, but my preferred method was always to give the neighbour a few dollars, (fifty of them in fact, a very generous number in 1990), to plug our power cords into a handy point for the duration of the project. Before starting work, I spoke with our soon to be neighbour, and he happily agreed that I could use the electricity, and thanked me for the fifty. On Monday, we started work and one of our carpenters popped his arm through the bedroom window to plug in to the point as arranged, to be greeted by what could best be described as a somewhat concerned person really, making something of a din. 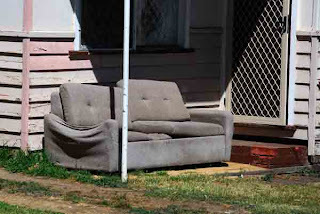 It seemed our now ex-neighbour had put all his worldly goods including my fifty dollars in his truck not long after thanking me with a straight face, leaving nothing more than an old couch and an unpaid electricity bill for the new tenant, who unsurprisingly was in no mood to be co-operative. With all the political strength I could muster, I approached the neighbour on the other side. It's as if you know the answer!